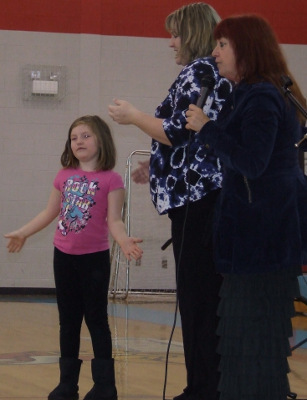 Storyteller and folklorist Anndrena Belcher entertained music teacher Cathy Qualls' classes at Powell Valley Primary School last Thursday. 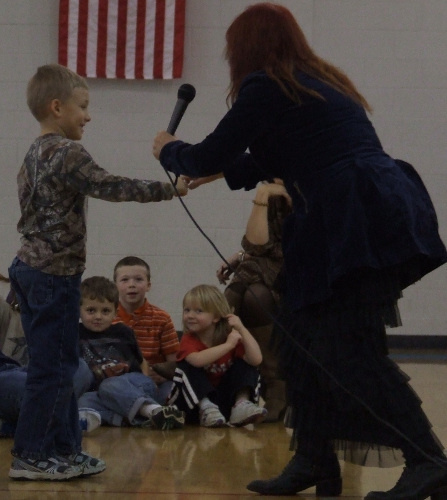 Belcher, who lives in Scott County, enlisted students and teachers to help bring her skits to life. Belcher calls her presentation of folk tales, personal narrative, poems and original and traditional songs "Anndrena Belcher for Old Time's Sake." Belcher is a child of the 1950s migration of people from the Appalachian region to northern industrial cities, and her tales reflect her familiarity with two worlds. "My family migrated from east Kentucky (Pike County) in the 1950s when the coalfields were mechanized," Belcher said in an interview before her presentation at Powell Valley Primary. "Three million people moved out. We wound up in uptown Chicago, which at that time was considered one of the nation's most diverse, multi-ethnic ghetto communities." "Out of 90,000 people, 70,000 of us were from Appalachia and the rural Deep South," Belcher said. "It was called 'Hillbilly Heaven.' We were one of the families that came home to these mountains once a month on a weekend." "A lot of what I ask about is what it means to live in two worlds, and to have the power of a personal story to help define a human experience and give a positive identity," she said. "That's why I do what I do." Source: Glenn Gannaway, The Post, December 15, 2011. Thank you for coming to our class and telling us stories about your upbringing! It really made me think about how alot of people come from the same background, even though it's different countries or areas. It also was a great example of how hardships bring people together. I hope it helped some people realize why it's not okay to judge others. It was very enjoyable. Kayla Miller, Eastside High School.